Remember Super Mario World on Super Nintendo? What a game that was, right? It inspired an entire generation of kids to aim high, reach for the sky, and aspire to be the best version of themselves in life! No it didn’t. The only thing Super Mario did to us millennials was make us lazy, bored out of our minds, and afraid to commit to any form of adult responsibilities. Anyway, in Super Mario World, there was Yoshi; a trusted dinosaur companion who, once saddled by Mario, allowed us gamers to run faster, jump higher and swallow enemies whole at the simple push of a button. Yoshi was our savior. He brought us places, made things possible, and we all loved him for it. The moment we saw his egg appear on our cathode ray screens, we needed our fix. We knew good things would happen. Which brings me to the 2017 Kia Sportage. 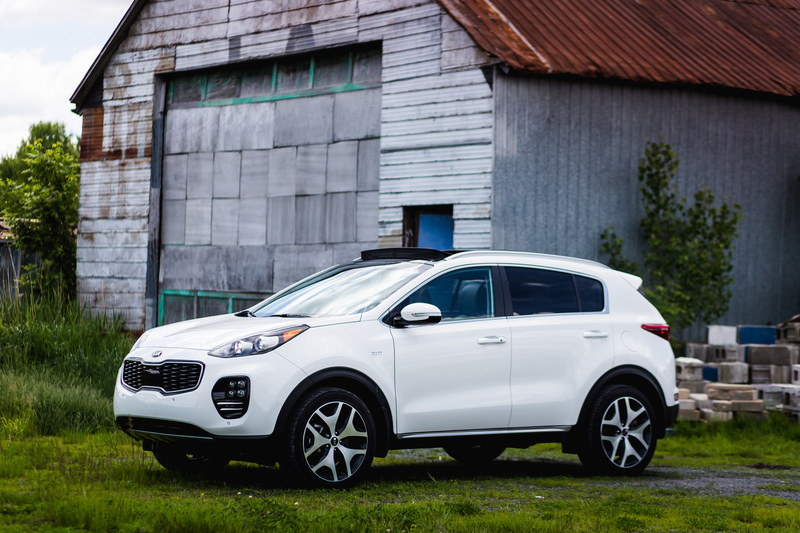 Like Yoshi’s dotted carapace in which he’d reside before Mario would break him free, the Sportage looks a little dorky, cute, and friendly, but isn’t an ugly sight. Instead, it’s welcoming, reassuring, telling you, with its cute baby-dinosaur’s face, that it will carry your young family where it needs to go without burning a hole through your wallet. It also proves once again that Kia knows precisely how to target its buyers. There’s no hiding the fact that the Kia Sportage is a corporate cousin to the Hyundai Tucson, a crossover I personally adored. But these two trucklets go further than the traditional badge engineering treatment. Although similarly proportioned, and sharing mechanical components with one another, they both go their own separate ways to each offer consumers unique attributes in their own respective rights. For starters, the Sportage does not get the Tucson’s Superstructure platform. So it does get unsettled a fair bit more over the rough stuff, with significantly higher wind and tire noise. 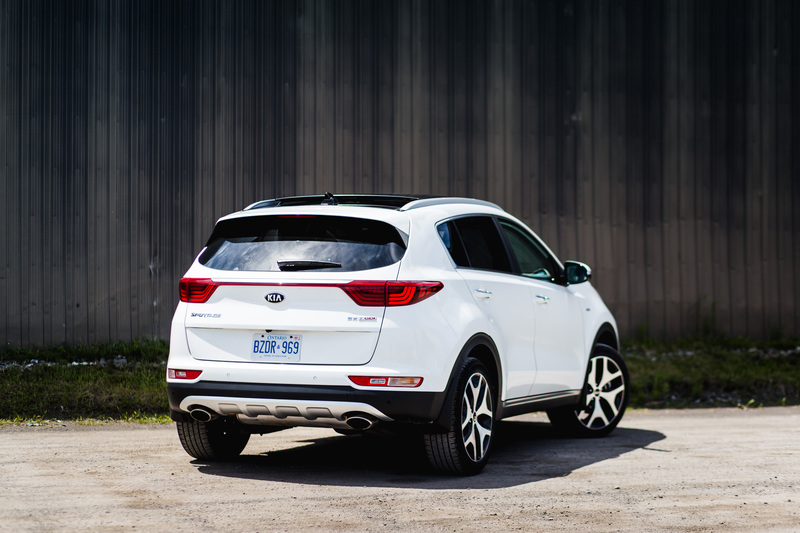 What the little Kia lacks in vault-like chassis solidity, it makes up for in nimbleness and playful handling. Yes, I actually wrote “playful” in a crossover review. 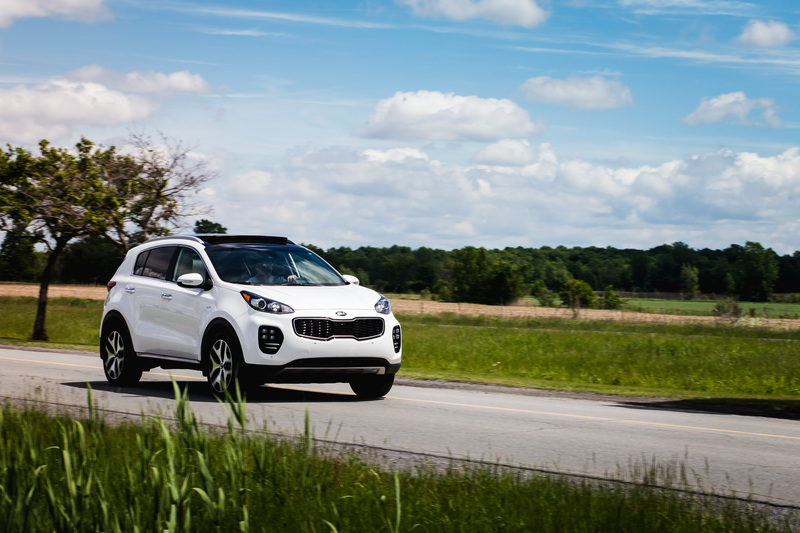 For this 2017 Sportage, Kia engineers drastically reworked the vehicle’s suspension, revised the electrically assisted power steering and stiffened the chassis at key areas to give it an athletic edge over the more serious-feeling Tuscon. From the way it handles, the Sportage is definitely a more alive package, but most buyers that will cross-shop between both vehicles will likely notice. 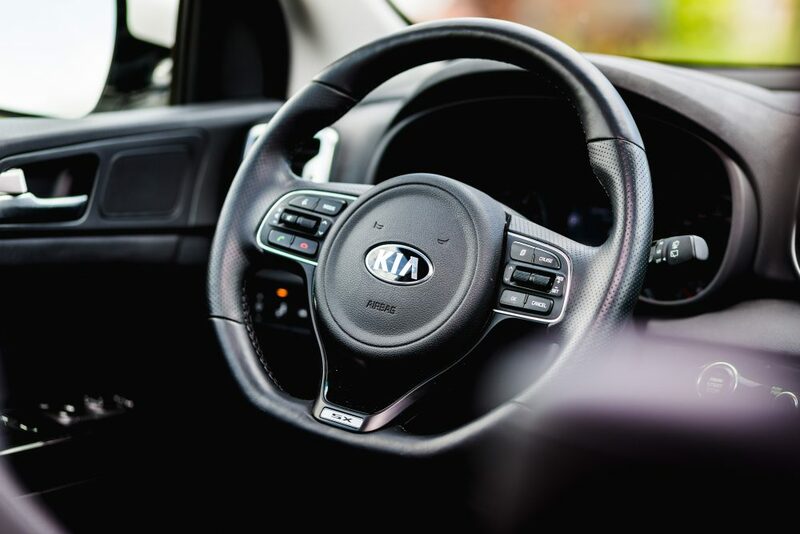 For my part, prior to getting behind the wheel of this Kia, I had just spent a week in Florida, on vacation, driving the Tucson as a rental car. While the Kia is a smidge more fun behind the wheel, driving both back-to-back felt nearly identical. But there’s no hiding the fact that this Sportage drives impeccably well, with body motions kept at a minimum and impressive compliance over the bumpy stuff. 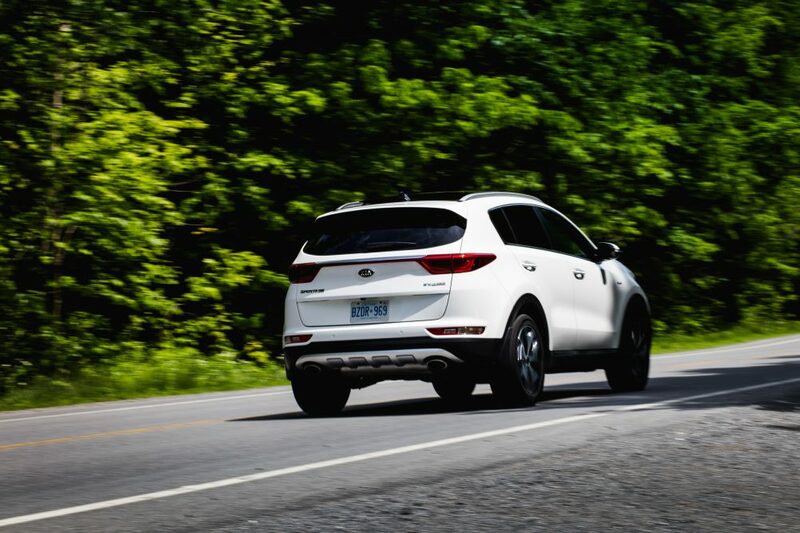 A Mazda CX-5, or even the smaller CX-3 is a tad more dynamic than this, but this Kia will easily outpace a Honda CR-V or Chevrolet Equinox in the twisties. Where the Kia Sportage distinguishes itself from the Hyundai, is in its powertrain options. My tester was the SX Turbo model, which comes with a rather peppy 2.0-liter, direct-injection, turbocharged four. For reference, the largest available engine in the Tucson is a 1.6-liter turbo. The Kia therefore gets a 62 horsepower advantage over its own cousin, with a total power output of 237 horsepower, and 260 lb-ft of torque. That also walks all over the Honda CR-V and Toyota RAV4, while hanging in the same ballpark as a Subaru Forester XT. 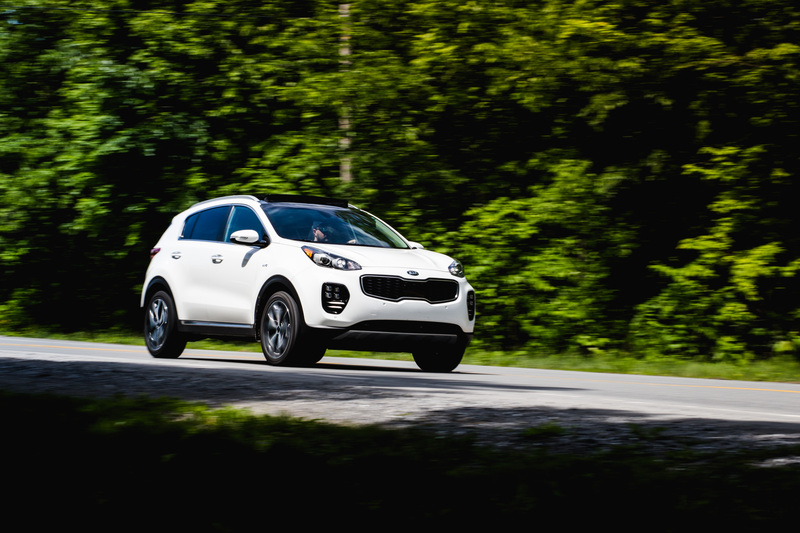 Base Sportage trims come with a 2.4-liter, 181-horsepower, naturally aspirated four, with either front or all-wheel-drive. 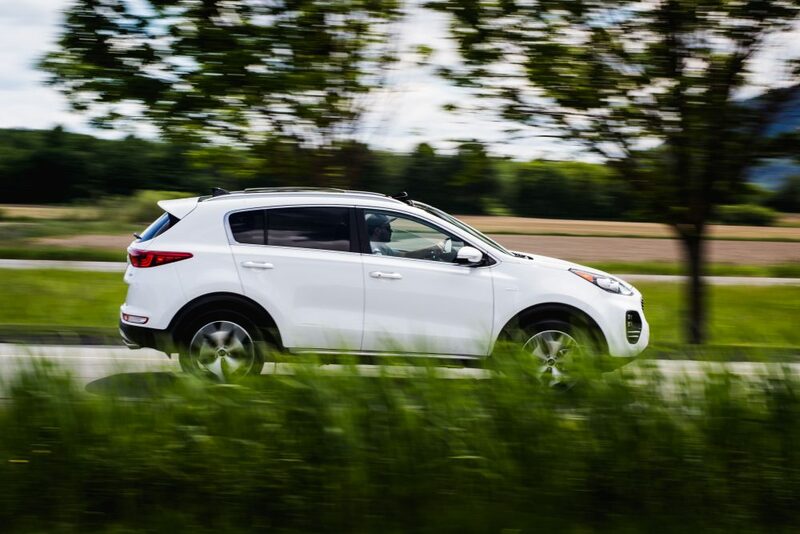 Power in the Sportage SX is sent to all four wheels via a six-speed automatic, unlike the Hyundai’s seven-speed dual-clutch unit. Ironically, the Kia gets steering-wheel mounted paddle shifters, which the Tucson lacks. I would suggest switching this around, it would make more sense. But hey, what do I know? Anyway, acceleration is quite decent for a crossover. Kia claims a 0-100 km/h time of 6.9 seconds, putting this cute little egg on wheels in a similar performance bracket as some hot hatchbacks out there. The turbo engine pulls strong, there’s plenty of low-end torque, allowing for brisk, easy-to-accomplish overtakes. 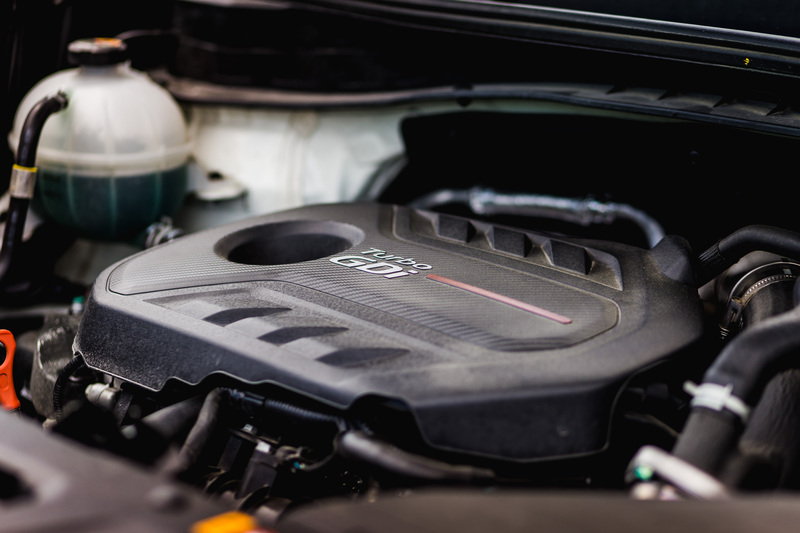 But this engine is far from smooth, due to a jolty throttle-by-wire system and slight turbo lag; it’s hard to modulate throttle inputs, leading to accelerations that are too aggressive or too weak. It’s all or nothing. This is a common problem with modern throttle systems coupled to turbocharged engines. Many carmakers struggle with getting it right. 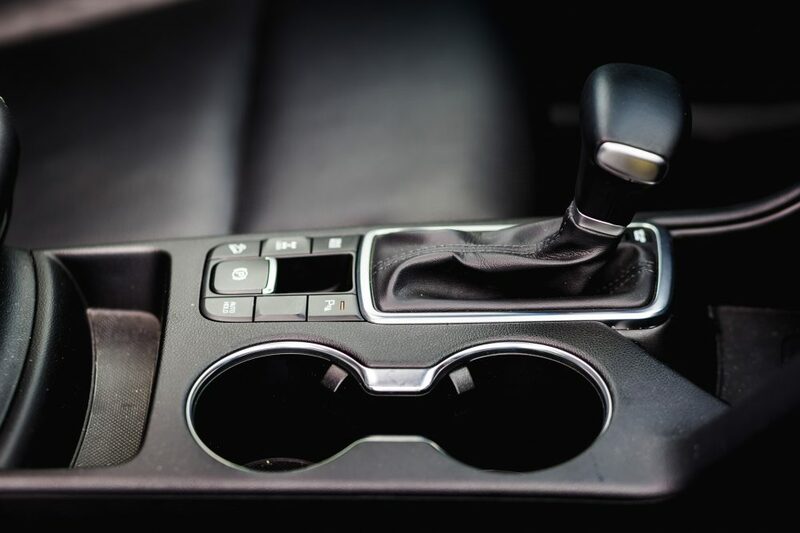 At least, the Sportage does get three drive modes to choose from; Normal, Sport, and Eco, which adjust throttle and shift programming according to each setting, helping qualm the problem. That automatic box also shifts nearly as quickly and smoothly as a dual-clutch system. It’s so good, that before reading the press kit, I was certain it had Hyundai’s DCT gearbox. Still, do expect some frustrating delays between the moment you hit that accelerator pedal, and when the vehicle actually gets up and goes. I gotta say, I’m impressed with how Kia has grown, both in aesthetics and refinement, and all in a short period of time. This Korean brand is no longer playing catchup with the Japanese and Germans. In some cases, it’s actually setting the trend. 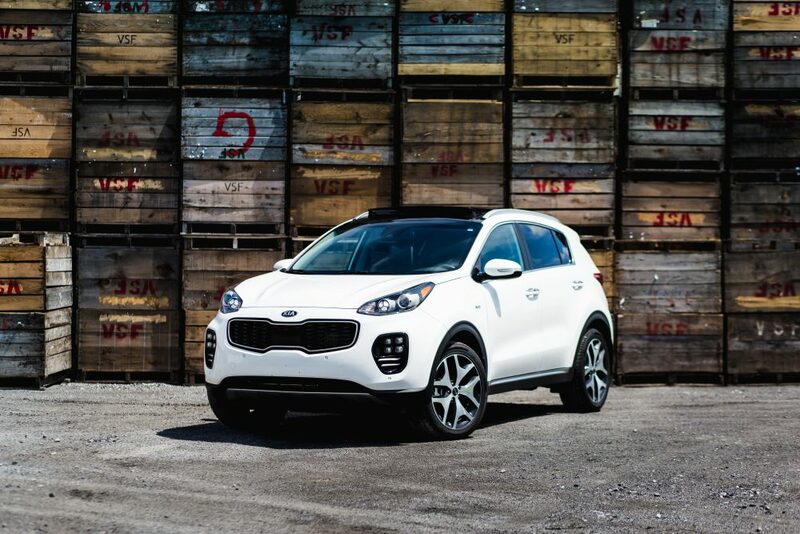 Step inside this Sportage, and you’re greeted to a utilitarian, yet well put together cabin. There are no frills, or funky design themes here, but materials are rich, especially the rubberized texture my tester’s dashboard was covered with. And options are plenty. Of course, mine was fully loaded. 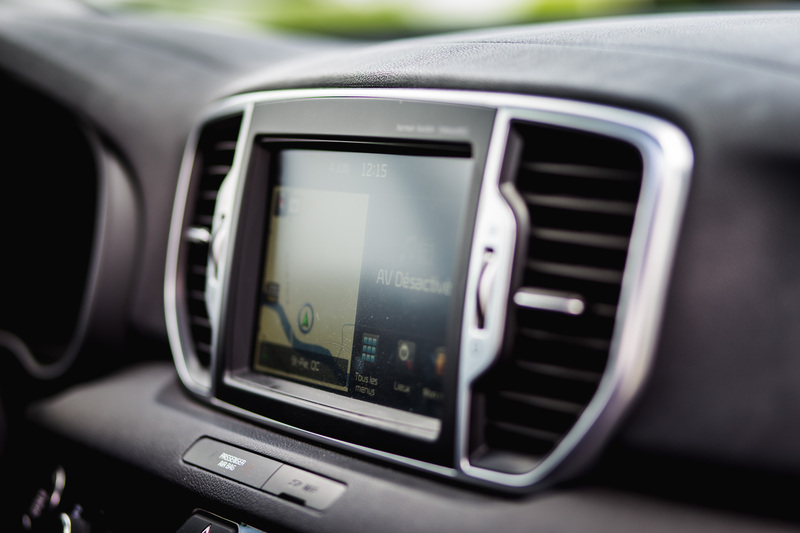 Still, it’s important to note that creature comforts such as a panoramic sunroof, heated seats, steering wheel, cross-traffic monitoring, blind-spot monitoring, a collision mitigation system with automatic braking, and Apple Carplay/Android Auto compatibility are no longer reserved for the one percent. If your Porsche doesn’t come with them standard, you can tell your sales rep that they’re all available in a Kia now. The Sportage also inherits the Hyundai/Kia corporate infotainment system, which remains among one of the best interfaces in the industry thanks to a clean menu design, simple controls, and quickly accessible information. Many premium carmakers such as Lexus or even Jaguar should take lessons from what the Koreans are dishing out in terms of technology these days. 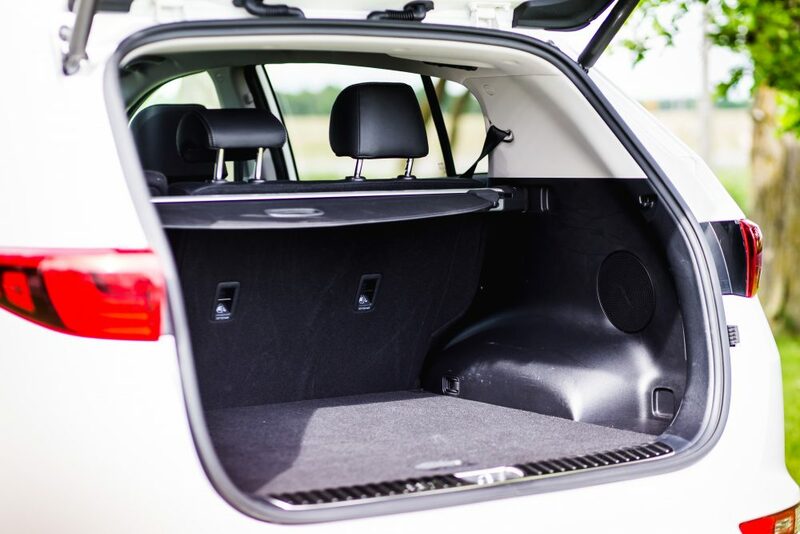 Overall comfort and interior room is another Sportage strongpoint. 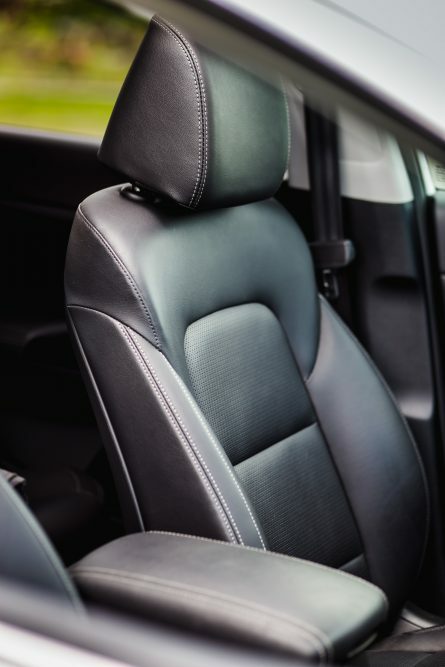 Rear seat room is ample, with supporting seats at all four corners of the car, and an incline function for rear occupants, a handy feature when your torso is as long as your legs. Total cargo capacity is only acceptable though, at 1,703 liters with all seats folded flat, the little Kia can’t keep up with the almighty CR-V and RAV4 at 2,152 liters and 2,078 liters respectively. In terms of size, even if the the Sportage is classified as a compact, it slots more in between subcompact crossovers like a Honda HR-V or a Jeep Renegade and more traditional compact crossovers like the Nissan Rogue, CR-V, or RAV4. Pricing for a 2017 Kia Sportage kicks off at a very attainable $24,895 for a base, 2.4-liter front-wheel-drive model. 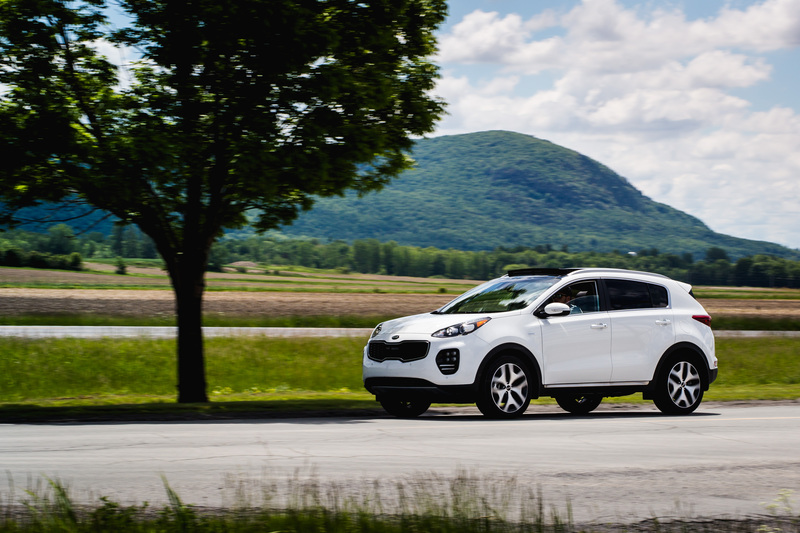 The cheapest all-wheel-drive Sportage will set you back $27,195. The almighty SX turbo you see here, tops the lineup at $39,595. To be fair, that’s starting to be expensive for a Kia, knocking at the door of Audi Q3 territory. As entertaining as the 2.0-liter turbo package is to drive, the idea behind a Kia is value, and in that respect, the SX model doesn’t quite cut it. I’d stick with the 2.4-liter trim levels, which shouldn’t exceed the low thirties, making a hell of a lot more sense for this nameplate. So yeah, The Kia Sportage is Yoshi’s egg. It’s a fun companion you can rely on, and looks sort of cool along the way. There’s definitely a lot to like here. My shooter Myle and I had a blast driving and taking shots of this thing through the countryside. It made us smile, you can’t deny the charm of its quirky character. While I typically despise crossovers, anything that looks different and puts a smile to my face is definitely worth considering in my book. Refined and well put together. Smaller cargo space than main competitors. Hi! Love your reviews! As of today on Kia’s website the Sportage SX is listed at 41 450$ which makes even less sense!